Let’s wind back to the “why”…. Two things happened when daylight savings ended. Firstly, the clocks went back and hour. Secondly, sleep in our house went back to what it was a year ago. We went from having a baby who slept 12 hours overnight to waking up to her four times a night and then also waking for the day anytime between 4-5am each morning. We went from baby heaven to baby hell. Although the change in sleep was for reasons still unknown, I’m pretty sure it was due to baby not yet fully transitioning from two to one nap and being overtired because of it, and then also going through a mental leap AND that weird biological drive to practise physical skills was keeping her up, since she started walking at that time. Whatever the damn reason, it was messed up you guys. We were still having to put in 40 hours at the office and we were like zombies. Parent zombies. Pombies? Parombies? Whatever. So yes. Sleep. It’s all been said before: It’s essential for your physical and mental health. It’s essential to you getting through the day without punching all the idiots of the world. And it’s definitely easy to see why sleep deprivation is a tool used in torture. Sleep deprivation is the ultimate mindfuck, if you were so inclined to inflict it on someone else. Firstly because I just couldn’t do my two jobs any good without a decent rest. Full time mum and full time employee takes its toll when you only have 24 hours in each day. And secondly because it was starting to take its toll on my mental health (let alone physical… Here’s looking at you newly sprouted wrinkles and gray hair!). I started to do a bit of research into healthy sleep habits. Some of the stuff I read online was so freakin’ basic that I thought, if you’re not doing it, you have no clue about life. But some of the stuff was good and I’ve started on a journey of figuring out how to get to sleep fast, and have sound sleep, while juggling a toddler who still, weeks later, tends to wake in the night every so often! Here are the things I did and maybe they can help you too! I started to reduce my nighttime screen time, which helped a lot. Backlight can be really detrimental to sleep as it stops production of melatonin, your sleepy hormone. For the same reasons, I also finally gave into my hubby who loves to sit in the lounge with minimal lighting, and replaced the bulb in my lamp to a softer wattage, meaning my room was a little dimmer and therefore my body was getting the nighttime message! I went to bed earlier and started reading before I went to sleep. This had a positive effect almost overnight! I found reading helped me wind down and as I was reading easy “chicklit” it required no thinking at all. Once it was sleep time, I started to do the 4, 7, 8 trick. This helped me to focus on something unstimulating and apparently it does some major hypnosis on your nervous system. This actually works! I mean, I don’t fall asleep in 60 secs like this article claims you will, but it does help me relax and it’s helped me fall back to sleep in the nighttime after attending to my screaming baby. I also downloaded the SleepBot app and started to check the quality of my sleep and track my sleep debt. I was getting to Friday with nearly 8 hours accumulated sleep debt and suddenly realised why I was so freakin’ exhausted every weekend! After that wee insight I started to mentally schedule in a weekend nap at the same time baby was asleep and this helped me to get on top of my negative sleep tally. One word of warning: If you are in any way obsessive about numbers, this might actually negate your life and cause you to unnecessarily obsess over your lost sleep. I use it as a tool to check in on how I’m going, decide on an early night or not (if last night’s’ sleep was bad), make decisions like if I’m actually up for a hard workout, or just a brisk walk with baby in the buggy, or if I could go out for that catch up drink with a friend (instead of pushing for a daytime coffee, believing a nighttime date would be out of the question). I looked at what vitamins, minerals and herbal preparations help to assist in the pursuit of sleep. I started using a 1000mg magnesium sleep pill (which turned my insides upside down) before switching it up for a less harsh 500mg dose, combined with tart cherry, B Vitamins, Chamomile and Valerian. For baby, I tried the sleep drops which kind of helped, although on the nights I forget to give it, it makes no difference. A friend at work said that when theirs was used up her toddler kept asking for it, so she filled it up with water and uses it as a nifty (and free) sleep queue! Speaking of baby, I started getting really hard on a consistent nighttime routine, and I’d talk her through it even though she’s only 16 months. So I’d say “Mackenzie, it’s dinner time”, then while eating dinner I’d say “Next it’s bathtime, PJs, stories, and nigh nighs”, then after her bath we’d say “PJs, stories, and nigh nighs”… you get the drift. Now she makes little baby babble noises when I repeat the sequence to her, like she’s repeating it back. ‘Tis very cute! Lastly, I started reading more about how daytime exposure to light can set you up for “good” circadian rhythms. This article here gives a good rundown of why, but basically it helps set your normal circadian rhythm so your body knows when it’s day and when it’s night. This gives me the ultimate excuse to get out of the office and into the daylight every so often during the day, especially as I work under harsh blue office light. This article explains that daytime exposure to natural light means you’re a little desensitized to bright light at night, meaning you actually can jump on your device in the evening, after all. A month on from this pursuit of sleep? I’m happy to report that baby is sleeping better, though not as perfectly as before, and I’m falling asleep faster and having deeper, more restorative sleep. 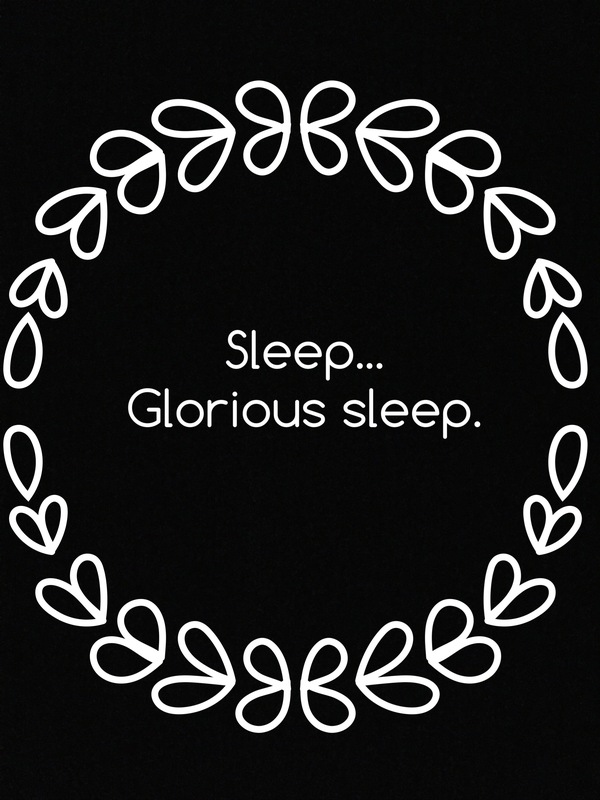 What sleep tips work for you?